The Guardian’s Alison Flood reported on a publishing industry deeply divided. In the same week, she noted, that writer of erotica Sylvia Day signed a startling eight-figure two-book deal with St Martin’s Press, a survey revealed that 54% of “traditionally-published” authors (and nearly 80% of self-published authors) earn less than $1,000 a year. Greenfield’s co-author, professor Dana Weinberg, agreed that “The question of money is a tricky one. Publishing a book for sale is a matter of both art and commerce. 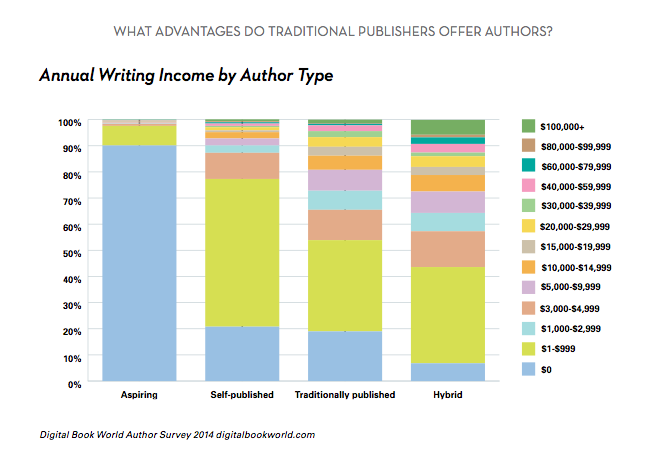 I would agree that for most writers publishing is not only about money; it’s about a lot of other things including touching readers and sharing stories, but the money is important in a lot of ways.